Milk Thistle Extract is drawn from the seeds of the milk thistle plant’s dried flowers. Its principal uses as a dietary supplement were first noticed in Germany several decades ago. Since then, Milk Thistle Extract has been employed extensively in European hospitals, and some German hospitals even keep it on hand as an emergency treatment. EHP Products offers Milk Thistle Extract to our customers because it may assist in their absorption of our Cetyl Myristoleate (CMO) supplement, Myristin®. 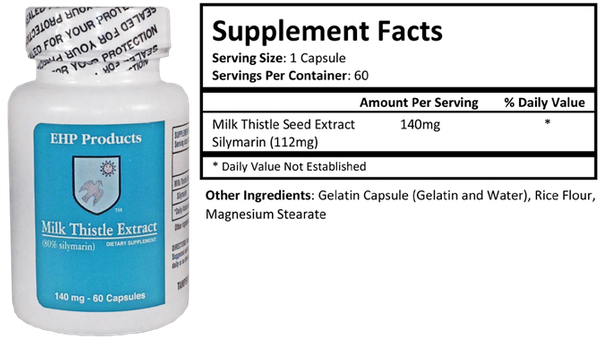 How can I supplement my Myristin® regimen with Milk Thistle Extract? Before starting on Myristin®, we recommend taking two capsules of Milk Thistle Extract three times daily with meals for ten days. Many healthcare practitioners also think that concurrent use of Milk Thistle Extract with Myristin® is helpful. For concurrent use, we recommend taking one Milk Thistle Extract capsule with each Myristin® softgel. Why should I choose EHP Products’ Milk Thistle Extract? There are considerable differences in the quality of milk thistle extract products on the internet and in stores. Our reputation as offering the gold standard in Cetyl Myristoleate supplements (Myristin®) carries over to other supplements that we supply. Our Milk Thistle Extract contains 140 mg of fresh, potent, standardized milk thistle extract, and within it is 112 mg of Silymarin, milk thistle’s flavonoid complex.